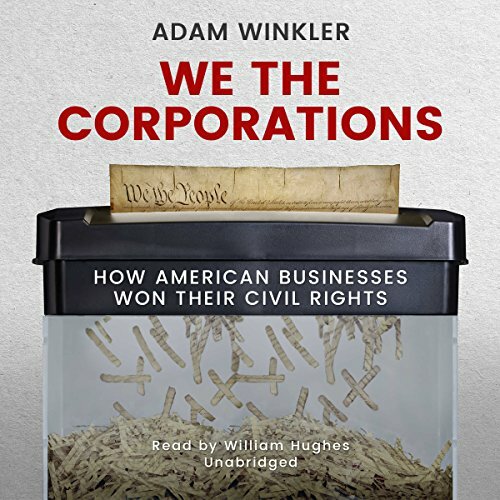 In this groundbreaking portrait of corporate seizure of political power, We the Corporations reveals how American businesses won equal rights and transformed the Constitution to serve the ends of capital. Corporations - like minorities and women - have had a civil rights movement of their own and now possess nearly all the same rights as ordinary people. Uncovering the deep historical roots of Citizens United, Adam Winkler shows how that controversial 2010 Supreme Court decision was the capstone of a 200-year battle over corporate personhood and constitutional protections for business. Bringing to resounding life the legendary lawyers and justices involved in the corporate rights movement - among them Daniel Webster, Roger Taney, Lewis Powell, and even Thurgood Marshall - Winkler's tour de force exposes how the nation's most powerful corporations gained our most fundamental rights and turned the Constitution into a bulwark against the regulation of big business. ©2018 Adam Winkler (P)2018 Blackstone Audio, Inc.
Let me count the "many books:" one is a treatise on the aims and logic of corporate-business thinking. One is an American history book across a big canvas, from an unusual business-history viewpoint. This zooms in frequently to colorful biographies of the business titans and superstar lawyers who brought about our commercial-personal world mix today. One is a history of cutting edge corporate law as it emerged. One is a deep meditation on personhood, the hottest topic in my mind these days, as it is where business, corporate (and other) law, and wildly creative tech collide, at the frontier of our human creativity. The next forms of creating artificial persons (quote-unquote) gets big swaths of my attention, and here is the deep background. All this is layered together in a sort of smooth flowing telling that seamlessly moves across these big areas. It takes patience and focus, but if the above interests you, run, do not walk, to the nearest device, to listen. When it wanders, it does so briefly and with purpose, leaving space in my listening experience to better absorb its stream of useful lessons. There are other print books out there with this sort of depth and intensity, but these are (1) rare in audio format, perhaps because of a limited audience (in this audio business so far), and (2) unwieldy to imbibe. This is a big book, and these days I am loathe to read very many physical books of this size. It is just hard to hold the thing and glare at it! And now, I'm outdoors, recreating, and this book makes my world perfect. Going in, I was concerned this might be a screed by the knee-jerk *evil corporations* faction. In the introduction, I kept worrying, as some popular memes popped up there. I needn't have worried. This is a deep work, written with tremendous style, passion and craft. Broader history fans might be amazed to find insight here: for example, the 14th Amendment was designed in a cluster of them (Amendments 13-15) to create a new legal regime to cope with the end of African-American slavery. How is it that such issues only became 5 percent of tgh Supreme Court's cases, and the remainder were mostly battles between proliferating corporations and state-local governments? This legal repurposing was a masterpiece of the craft of the corporate lawyer superstars of their day, often mining their sterling reputations (OK, in 1960s jargon, selling out) to pull off amazing sleight-of-hand moves to nudge the conversation to a whole new framework of corporate rights. This is merely a sample of the big ideas put brilliantly on display here. But the casual listener (or those impatient with a slightly wandering, colorful, narrative-laden style) may be put off. I love it. loved how in depth the material was it kept it interesting and easy to listen too. A comprehensive account of the founding of America as a corporation! And why business always wins! This book is amazing and the reading of it it's also very well. I highly recommend this book. required reading for those interested in American politics. This is easily the most interesting and accessible book on what is going to be a crucial issue in American politics. Corporate America will try every way possible to distort and minimize this issue. It is incumbent for at least a small segment of the public to understand the ins and outs of corporate constitutional rights. There is no limit to the power they seek. They already have four Justices on the Supreme Court that are favorably disposed to extending almost all civil rights to Corporations either through legal personhood or if necessary to pierce the corporate vail to find personhood even though stock ownership by persons in modern society is unknowable.